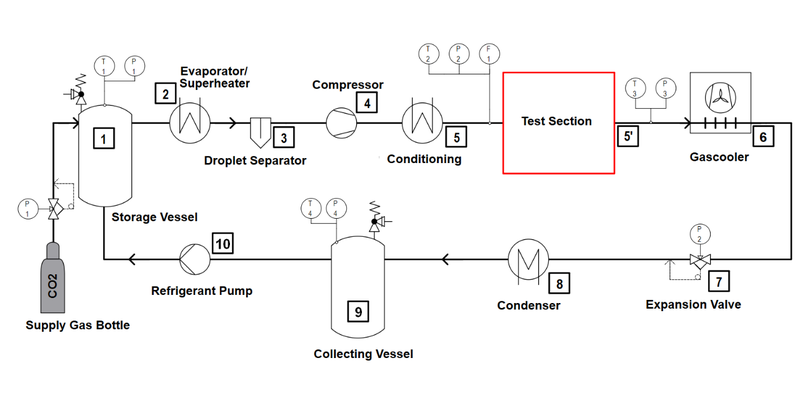 The test facility SCARLETT basically consists of heat exchangers, heating radiators, compressors, valves, pressure vessels, a data acquisition and a modular test section. This test section can be replaced at any time depending on the need for research. As can be seen in the schematic, liquid CO2 is stored in a pressure vessel, called storage vessel (1). CO2 is first completely evaporated and then superheated up to 10 Kelvin by an electrical heated evaporator (2). After passing a droplet separator (3) where the last liquid drops are removed from the gas flow, the CO2 is entering a piston-compressor (4). There the CO2 is compressed leading to supercritical temperatures and pressures (> 73.8 bar). Thereafter, the supercritical CO2 flows through a heat exchanger (5), where it is cooled or optionally heated to the desired testing temperature (conditioning) and then enters the test section - represented as a black box in the schematic. The test section offers a variety of experimental setups for basic research. After leaving the test section (5'), the CO2 flows through a gas cooler (6) and is thereby cooled to ambient temperature. Then the CO2 is expanded in an expansion valve (7) to subcritical pressure. The resulting CO2 wet steam is completely liquefied in a condenser (8) and then passes into a second pressure vessel (Collecting vessel) (9), which is also used for hydraulic compensation and gas/liquid separation. 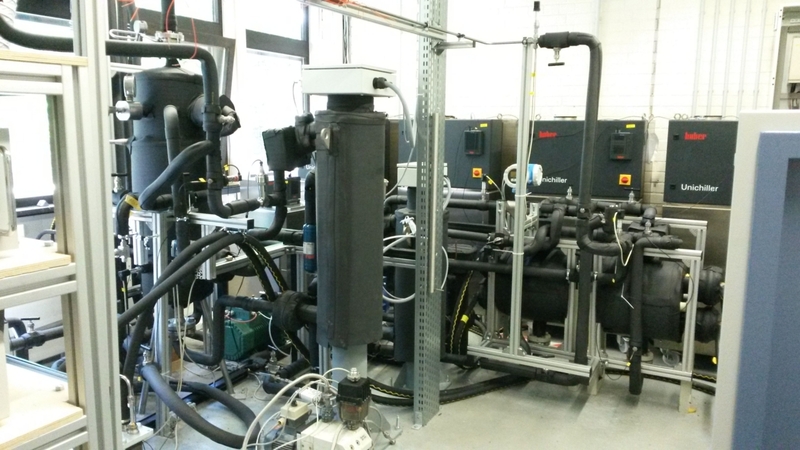 With the help of a refrigerant transfer pump (10), liquid CO2 flows back into the storage vessel and the circuit of the test facility is closed. At the plant SCARLETT different experimental set-ups are planned. At all experiments supercritical CO2 enters the test section at a defined temperature and a defined pressure. The design of the test sections is variable and depends on the aims of the investigation. 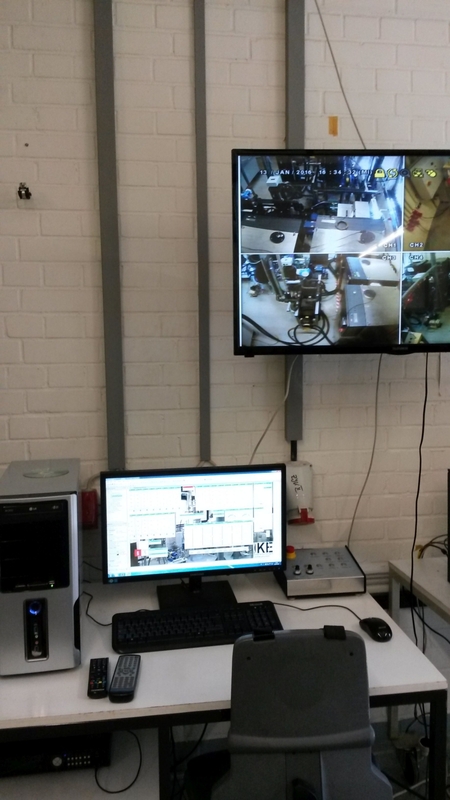 Until now several projects were carried out using the test facility SCARLETT, funded by the European Commission (EU) and the Gesellschaft für Reaktorsicherheit (GRS), Germany.